Continuing our look at the novelization of the 1966 Sherlock Holmes film A Study in Terror, here is a 1967 Lancer paperback that curiously makes no mention of the movie nor even Sherlock Holmes on the cover! This one is packaged solely as an Ellery Queen adventure. Very different from Lancer's 1966 edition. 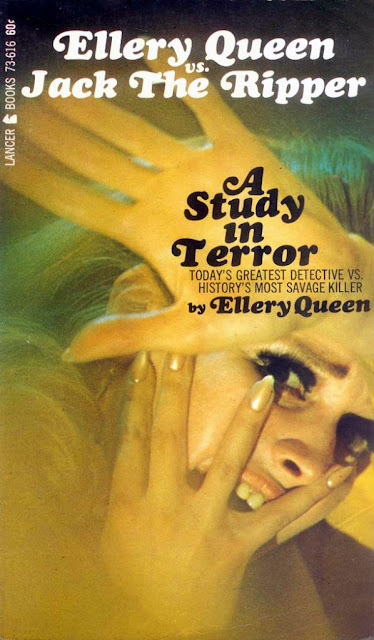 Ellery Queen and Sherlock Holmes-Undisputed masters of analytical deduction - their talents and methods strikingly, almost uncannily, alike. Through the strange interlocking of events past and present, two celebrated detectives meet to focus their razor-sharp intellects, their brilliant powers of observation on the mystery of... Jack the Ripper. History's most depraved murderer, his victims were the whores of Whitechapel. Lurking in narrow, fog-shrouded alleys, he crept forth night after night to murder and mutilate. Eluding Scotland Yard's most heroic efforts to track him down, the Ripper continued to satisfy his unnatural appetites, unrestrained and unidentified.